If I had the tough skin that it takes to be an activist or even a journalist around horse slaughter, I'd be there. But I can't even watch a movie in which a horse, or any other animal, gets hurt. My brain can't let go of the images, and I'm reduced to a bucket of tears and of no use whatsoever. But I can be FOR something...I can be an advocate. So that's where I've settled: creating art to share the wealth of feelings I have in the presence of horses, and artful children's books to inspire empathy for horses in children (and any adults reading them). Have you ever wondered why you're inspired to do something you simply can't NOT do? Create a dream board. I have made several in my life, and I'm always grateful for what I learn. 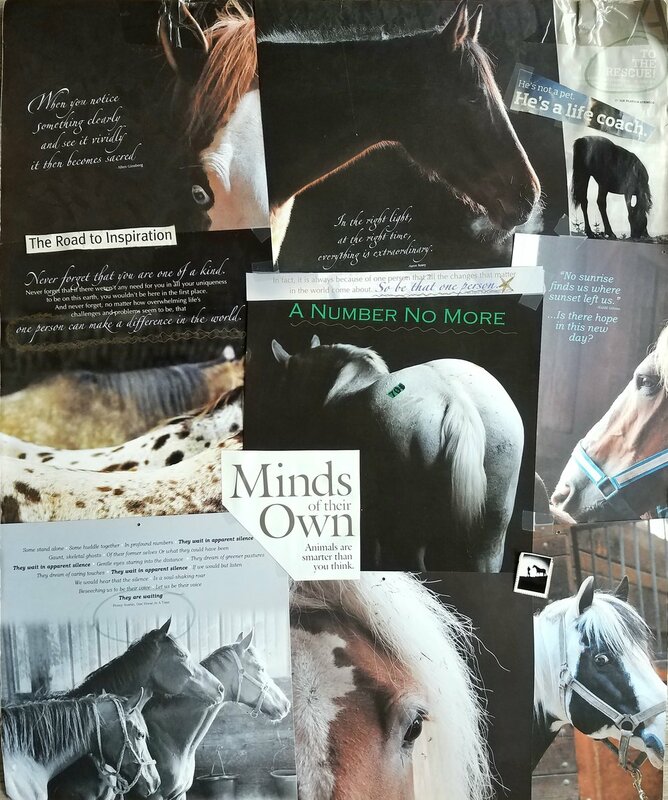 My "Minds of their Own" dream board came together out of my desire to help horses after seeing so many images and articles about horse slaughter. The images for my board came from an equine photographer's editorial calendar on the topic of horse slaughter and several magazines I had around the house. THIS was the reason I drove around looking for horses to photograph. I wasn't sure what I was going to do with all the images; I just knew I had to do something with them that helped horses in some way. If you want to be an advocate for horses with me, you can share my children's book with a child to help grow his or her empathy for horses or simply ask children how their pet(s) communicate with them and how they know what they're saying...because animals do have minds of their own, and are smarter than we think! I'd like all children to grow up loving horses and eager to learn how to listen to them as individuals with hearts and minds rather than as recreational vehicles with go and stop problems. It's a step.